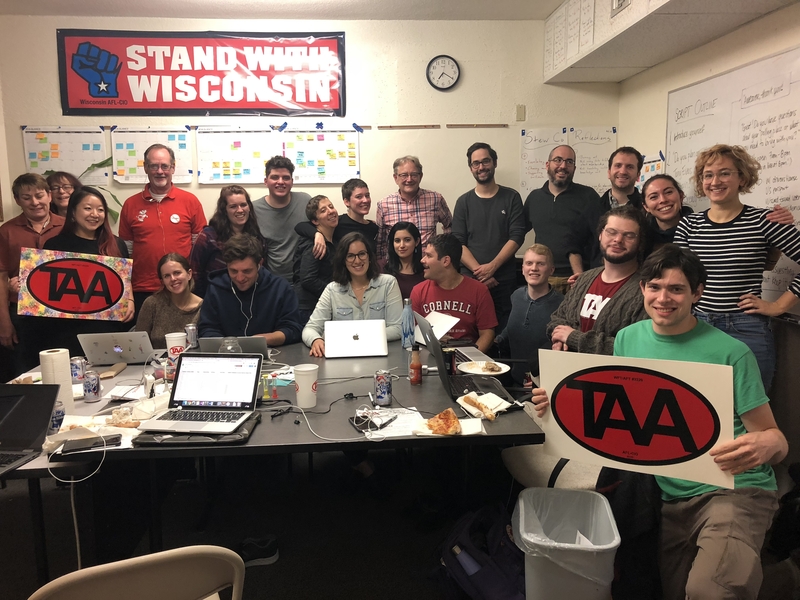 The Teaching Assistant’s Association (TAA) of UW–Madison congratulates Tony Evers and Mandela Barnes on their successful election. This outcome is a testament to the strength of our members and grassroots activists across the state who tirelessly knocked on doors, registered voters, and ultimately turned out to the polls to elect new political leaders in Wisconsin. Our union looks forward to redressing the damage of Scott Walker’s terms in office. We urge the winners of this historic election to keep their promises to our communities, and to take all necessary steps towards reversing Act 10, restoring adequate resources to public education, and rolling back the many disastrous policies that have led to the deterioration of communities throughout the state. This moment is worthy of celebration, but not of rest. The power of our union arises from our solidarity, strength, and sustained efforts to organize for social and economic justice. The power of our union lies in the willingness of our membership to come together and fight for what’s right, regardless of who holds office. The TAA will continue to fight for economic dignity (including fair pay for women, people of color, immigrants, and international workers), trans-inclusive universal healthcare, quality public education, and democratic governance of the University of Wisconsin. We congratulate the incoming Governor and Lieutenant Governor and look forward to working with them to strengthen our public institutions, including the University of Wisconsin System. The fight isn’t over. Join us in shaping the future of Wisconsin.